For me, it’s hard to think of many things that bring the same kind of joy as tearing through the woods on a dirt path as fast as I can go on two wheels. After some years of riding, I not only have some good stories, but have been fortunate to have a lot of tips passed on to me. Some of you may be familiar with this information, but in my presentations I give during rallies and trade shows, I find that I have some knowledge that helps most riders. So I decided to further share this knowledge by writing a blog devoted to “Jeremy’s Tips for Adventure Riding”. What is so important about ergonomics? And what the heck is it? The dictionary states, “The scientific study of equipment design, as in transportation seating, for the purpose of improving efficiency, comfort, or safety”. In layman’s terms, it’s where you’re seated on the bike, where your four limbs fall in place and how well they operate the controls in their positions. Ergonomics is one of the most important things to consider on your motorcycle. Think about the first thing you do when you sit in a rental car. Most of us adjust the seat height, position, steering wheel tilt and telescope, mirror and maybe even have the pedals. 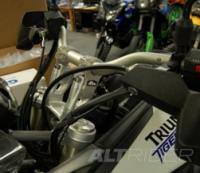 On a motorcycle, it is usually more important to be able to reach your clutch and both brake levers comfortably. It sounds basic, but it’s an important topic that doesn’t get covered enough. If you’re new to Adventure Riding or have never ventured off-road, it may be something that doesn’t cross your mind. 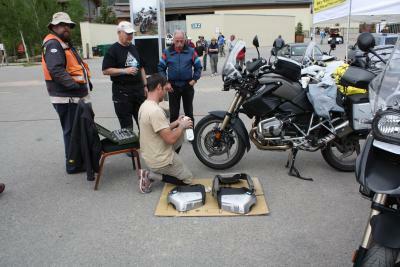 Most bikes are set up in the back of a dealership, unaware of the dimensions of the owner who will ride the bike. Because most bikes are set up for seated riding, the rider needs to adjust the controls in order to comfortably operate for off-road riding. With very basic tools a rider can loosen the clutch and brake perch to rotate so the rider hands rest in a natural position based on how that rider sits or stands on his or her bike. Another adjustment that is only on some bike models is how far out the levers are from the handle bars. Many OEM setups have the lever set very far from the bar allowing for a long stroke. Many setups allow you to adjust the lever closer to the bar with a set screw at the inside pivot point of the lever or with a star adjust, where the cable inserts into the perch. Bringing the lever closer to the bar allows the rider to operate with 2 fingers while still maintaining a strong grasp on the handle without fatiguing the hand because the fingers are not all at full extension. Also for people with smaller hands, it is helpful to be able to have the levers at a proper position. Since we’re on the topic of levers, another simple upgrade is to remove the lever, then clean and re-lube the pivot point. As the bike takes on some mileage on those long adventures, this bit of maintenance will make a difference down the road. While you have the lever off, use a lube tool to force lube into the cables if your bike does not have a hydraulic system. 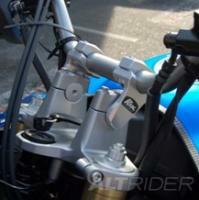 Improve your handlebar ergonomics by adding shorter or adjustable brake and clutch levers. ASV Levers are a very common and reliable source for these, available in several options. This prevents the lever from pinching your other fingers when operating levers with 2 fingers, allowing you to grip the handlebar with your other 3 fingers. A common site at rally is a rider hunching over because their bars are too low and he had never thought about how this is forcing him to look down while standing (you know… you kind of feel like Quasimodo, the Hunchback of Notre Dame). Keeping your eyes up and your focus ahead is critical to balance and easily reacting to obstacles and terrain. As well, standing for long periods of time while being hunched over can be rather uncomfortable. The rider must keep their eyes forward to read the terrain. A 2” rise in the handlebars can quickly and easily remedy this issue. We recommend purchasing a set of handlebar risers like ROX Risers which provides more value than traditional risers because the bar can be set closer or further away based on your preference and normal riding position. For more information about these handy ROX Risers, check out the informational video of ROX Risers on our Yamaha Super Tenere. Handlebar risers are generally about 2.5 out of 10 on the difficulty scale to install and take 15 minutes. This depends on your chosen height and tilt position – keep in mind that extended brake lines may be required, and will add more time and challenge because you need to bleed the brake system. In our experience, brake or clutch line extensions for the GS, GSA, F800GS, V-Strom’s, and Multistrada do not require line extension or modification. Another adjustment that can take a lot of load off of the knees is to lower the foot peg, a feature most bikes don’t have as standard. One great feature for the BMW R 1200 GS, Yamaha Super Tenere, and Triumph 1200 Explorer is that they allow for a very quick adjustment underthe seat to raise or lower the seat approximately 1 inch. The idea is to set the seat high for long touring to relieve the knees, or lowering the seat when going off pavement to make standing much easier in the technical terrain --this can be a help to even tall riders. Some of you with short inseams who ride off-road, can consider the shorter seats that many OEM’s now offer, or many bikes can be lowered affordably and easily with a shortening “dog bone” which is a link in the rear suspension. Those who are really tall may benefit from a tall seat, not just for highway miles but to reduce the effort required to go from sitting to standing. Believe it or not, being 1-2 inches closer to standing is a lot of engery during a full day of off-road riding. Try playing with your setup and testing it on some short rides. This may take you some time to get it dialed in, but it is well worth the effort and is simple to do in your garage. By improving ergonomics you will reduce fatigue and improve your comfort; this translates into freeing you to focus and improving your confidence. This all leads to the important increase in the FUN FACTOR. If you have any additional tips, questions, or feedback please let me know. I am interested to hear what you all have to say. Call, email (info@altrider.com), or visit the AltRider team at our Seattle location. Please subscribe to this blog as we will be updating it every month with new tips and tricks for you. Thanks to take a time to write about the things that sometimes don't look important. In the Supertenere how much tire pressure did you use in off road conditions.